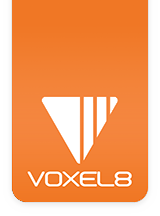 Loading the Voxel8 Silver Conductive Ink. REMINDER: If you haven't already, before working with the conductive silver ink, please read the (Materials) Safety and Data Sheet (SDS). 1. Before you begin working with the Conductive Silver Ink it is recommended to wear protective gloves (see Picture 001). Inside your Voxel8 shipping box you will find a pair of black nitrile gloves which you should wear while working with silver (FYI: they are size Large). Picture 001: Gloves recommended to be worn while working with the Conductive Silver Ink. 2. Now it's time to load the silver conductive ink cartridge into the Developer's Kit. A.) Locate a silver cartridge (see Picture 002) contained inside your Materials box. Picture 002: Silver barrel syringe fully capped. B.) Remove both blue caps from the ends of the silver cartridge starting with twisting and popping the blue cap top (see Picture 003a) and then unscrewing the bottom blue cap (See Picture 003b). Picture 003a: Silver barrel syringe with top cap removed. Picture 004: Silver barrel syringe with both caps removed. C.) Locate the box of 250 micron red nozzle dispensing tips (see Picture 005) to attach to the end of the barrel syringe. Picture 005: Red nozzle tips. D.) Screw one of the red nozzles onto the end of the silver cartridge with the screw-in end point (i.e. lauer lock) (see Picture 006). Picture 006: Silver barrel syringe with lauer lock nozzle screwed in. 2. Using the touch screen, select "Change Syringe/Tip" (see Picture 007) from under the "Control" button from the main screen. Picture 007: Change Syringe/Tip in the Control area. 3. Next, you need to install the assembled silver cartridge into the right hand extruder. A.) Use the touch screen and click to the "Next Step" (see Picture 008) for insertion (since you are not replacing an existing syringe). Picture 008: Instructing the printer you're about to remove the silver syringe barrel. B.) Find the blue cap end of the pneumatic pump (see Picture 009). Picture 009: Attaching the silver barrel syringe to the pneumatic system. C.) Fit the silver cartridge onto the opposite side of the red nozzle (see Picture 010). Picture 010: The pneumatic end point is twisted onto the silver syringe barrel. D.) Twist the blue end point until the syringe is secure (see Picture 011). Picture 011: The silver syringe is now locked into the pneumatic system. E.) Now "Lower Tool" in the touchscreen user interface (see Picture 012), so that it's easy to push the silver barrel syringe into the cartridge holder. Picture 012: Lowering the silver print head cartridge so you can insert the barrel syringe into it. F.) Firmly, but carefully insert the silver cartridge into the black press fit hole on the right print cartridge head area (see Picture 013). Picture 013: Inserting the silver barrel syringe into the right Print Head Cartridge area. G.) Push the silver barrel syringe downwards so that the press fit is snug and secure (see Picture 014A & B). Picture 14B shows the full extent of how far down the syringe should go when inserted properly. Picture 014C shows how far the red nozzle should be down when in lowered position after insertion. NOTE: You may have press hard and may hear a click to make sure that the silver barrel is loaded correctly on your machine. Study Picture 14B closely to make sure you've inserted the silver correctly. Picture 014A: Pressing the silver syringe into the silver print head (Not Fully inserted). Picture 014B: Ensuring that the silver syringe is fully pressed down (FULLY inserted). Picture 014C: Approximate nozzle tip position after loading silver. H.) Now confirm that you have changed the syringe in the user interface (see Picture 015). Picture 015: Verifying that the syringe has been changed. 4. Ensure that the silver print head is snug within its carriage holder (see Picture 016 & 017). Picture 016: Making sure that the silver side is properly secured in the print cartridge holder. Picture 017: If you did not lower the tool, the Silver syringe will be in this position. 5. Recycle the blue caps left over from the barrel syringe (see Picture 017). Picture 017: Cleaning up the area of caps. 6. Wipe up any spills of silver in the area that may have occurred. 7. Nicely done. Now you're ready to start the alignment process. You can click the "Align" button to advance, or select it from the "Control->Alignment" button. Picture 018: Ready to Align. The next step is alignment.